This country home boasts a relaxing wrap around porch on three sides, perfect for lazy weekends. The bow window in the dining room offers views and brings in ample natural light to the space. The master bedroom is located on the main floor for convenience and privacy and includes a walk-in closet and luxurious bath. 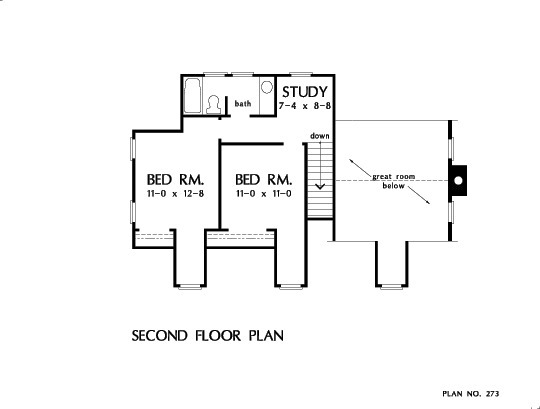 Upstairs you'll find two more bedrooms and a large bathroom plus a small study space that's ideal for doing homework or as a playroom. 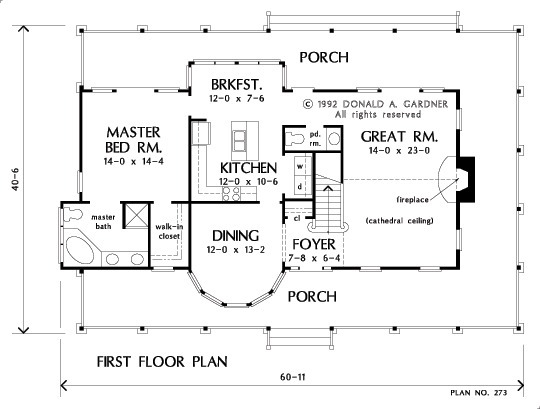 House Dimensions: 60' 11" x 40' 6"
Great Room: 14' 10" x 23' 0"
Foyer : 7' 8" x 6' 4" x 9' 0"
Great Room (Cathedral): 14' 10" x 23' 0" x 24' 0"
Kitchen : 12' 0" x 10' 6" x 9' 0"
Breakfast Room : 12' 0" x 7' 6" x 9' 0"
Utility Room : 3' 8" x 6' 0" x 9' 0"
Master Bedroom : 14' 0" x 14' 4" x 9' 0"
Bedroom #2 : 11' 0" x 12' 8" x 8' 0"
Porch - Front : 57' 6" x 7' 9" x 0' 0"
Porch - Rear : 57' 6" x 7' 9" x 0' 0"
Porch - Right : 7' 9" x 23' 8" x 0' 0"
Loft / Study : 7' 4" x 5' 4" x 8' 0"